Eyal Golan, an immensely popular Mizrahi pop star in Israel, is now using John Lennon’s law firm. It’s not about music, but rather about a thorny legal problem: The New York law firm, which helped Lennon avoid deportation from the US in the 1970s, is now battling to obtain for Golan a visa to perform and work in the US. The Department of Homeland Security approved Golan’s application for an O-1 visa, which allows artists and others to live and work in the US. But the State Department said it would review Golan’s character to determine if the visa can be approved, according to a public relations firm working with Wildes & Weinberg, the New York law firm representing Golan. Golan’s US visa request was reportedly denied based on the fact that employees of his music company in Israel were convicted of tax evasion. Golan, one of Israel’s most successful Mizrahi pop stars, has sold over 21 million copies of his albums over his 20-year career. His reputation has also been sullied by his proximity and involvement in several illegal activities, including tax evasion and a scandal in 2013, when he was accused of engaging in sexual activity with underage girls. Golan was interrogated by the police in 2014 regarding the sexual encounters, but the case was dropped due to a lack of evidence and he denied the allegations. The singer was found guilty in 2014 of evading taxes and falsifying billing on income of NIS 2.6 million ($750,000). He had to pay a fine of NIS 75,000 ($20,000) and did four months of community service at an old age home in Rishon Lezion. Employees of Golan’s record company were also convicted of tax evasion. In 2015, Golan’s father was sentenced to two years in jail after being convicted of procuring minors for purposes of prostitution, among other offenses. He was charged with using his son’s fame as a well-known performer to take advantage of the girls, knowing that they suffered socioeconomic hardship and had difficulties at home. That same year, Golan was denied a US visa for planned appearances in concert with Sarit Haddd in Miami, Los Angeles and New York. Anyone who has been found guilty of evading taxes is automatically refused a visa by the US government. While Golan has worked hard to redefine his image, it hasn’t made much of a difference to the US embassy, and now he’s retained the law firm to represent him. The case differs in context than Lennon’s, but the goals are similar. Wildes & Weinberg represented the Beatle from 1972 to 1976, when he was living in New York City and US immigration authorities threatened to deport him, due to a 1968 conviction in England for marijuana possession. 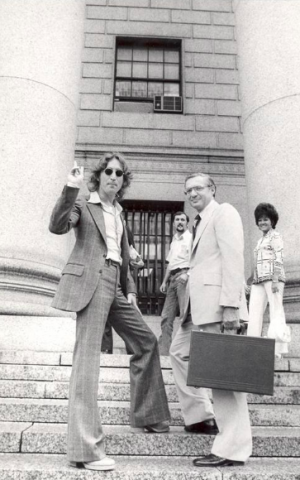 The law firm led a legal battle against the deportation, in part by proving the US was selectively targeting Lennon. Wildes & Weinberg also argued that the US could not judge the character of its prospective visitors based on charges sustained within foreign courts without any evidence that the accused knew about the criminal conduct. Lennon and Yoko Ono ended up securing their green cards and remaining in the States. Eyal Golan may not be so lucky; it seems pretty clear that he knew about his criminal conduct.